This photograph came with a box of my great grandfathers items including letters, diaries and other photographs. 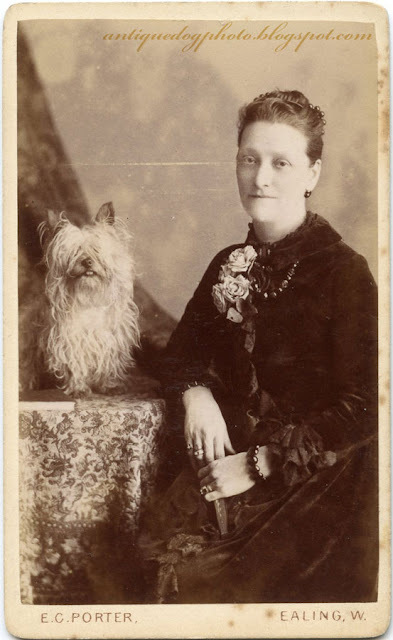 The thing is that there is no one left alive who can identify the woman in the image (or the dog!) She doesn't closely resemble any members of my family so I'm going to presume she was a friend of the family. Her little dog is a prick-eared Skye Terrier. The origin of the Skye Terrier is shrouded in as much mystery as the identity of the woman in this photograph. Its origins are said to be from the Maltese dogs that came during the 17th century, on a shipwrecked Spanish Armada and bred with the local "Celtic terriers" on the Isle of Skye in the Scottish Hebrides. This makes the Skye Terrier the oldest of the Scottish Terrier breeds and the ancestor of the five breeds of the Scottish Isles which still exist today: The Skye Terrier, The Scottish Terrier, The Cairn Terrier, The West White Highland Terrier and the Dandie Dinmond Terrier. Sadly the Skye Terrier is now on the UK Kennel Club's list of most endangered breeds, with only 44 puppies registered in 2011.